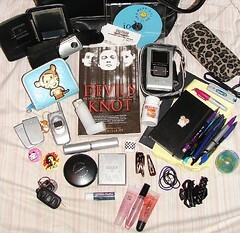 A couple of fellow bloggers emptied their purses to show what's inside. I thought I'd do the same. 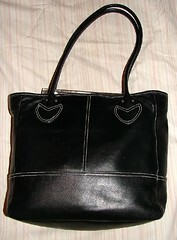 This is the bag I was carrying today. It's one of my most boring, least cute, but most functional bags. It's large enough for magazines or work folders. It's a cheap, non-leather Target bag, as most of mine are. I'm not into labels and would much rather spend a small amount of money on a lot of different bags than a lot of money on one really nice one. I tend to change what I'm carrying frequently. The contents are pictured below. Click on the photo for detailed notes at flickr. I don't seem to have as many receipts and little hand-written notes as I usually do. I think it's because I cleaned it out last night. I do note a disturbing lack of candy or snacks. I noticed that my Tide To Go stain removing stick was suspiciously missing. I found it in another bag that I was using last weekend. Luckily, I haven't spilled anything on myself for a couple of days. Truly amazing. wow how can you get so much in there! Looks like I started some sort of trend, eh? Who knew everyone was dying to reveal the contents of their purses! It's definitely an interesting look into someone's life. And yours, my friend, looks way important and busy, what with the Palm and extra cell phone batteries! Thanks for sharing! What are you saying, that I'm a label whore? fun! I might give this a try.